Like Jarasandha, king Bhagadatta was another impediment for Yudhisthira's Rajasuya sacrifice. Jarasandha was slain by Bhima by executing the clever strategy formed by Krishna. Bhagadatta was however a friend of Pandu, the father of the five Pandavas. Arjuna chose to use diplomacy to subdue Bhagadatta, rather than slaying him in battle. Arjuna subdued Bhagadatta in Pragjyotisha (see Arjuna in Pragjyotisha) through peaceful means and extracted tribute from him and the kings under his sway. The territories involved in this part of the mission included Kulinda, Pragjyotisha and Kinnara. These territories lied mostly in Himachal_Pradesh. From there Arjuna moved to territories in Punjab that were under the sway of the Trigarta tribe (see Arjuna in Trigarta) which included the territories of Uluka, Trigarta, Kuru-Bahlika and Paurava. Arjuna continued his march towards north and reached the territories controlled by the Kambojas, like the kingdom of Kashmira, Kamboja, Darada, Loha and Rishika which lied mostly in Jammu and Kashmir (see Arjuna in Kamboja). Finally Arjuna reached Tibet traveling along the Sindhu river. There he encountered the territories of Kimpurushas, Guhyaka-Yakshas, Gandharvas and Uttarakuru (believed to be part of the Deva territories in the Harivarsha region). 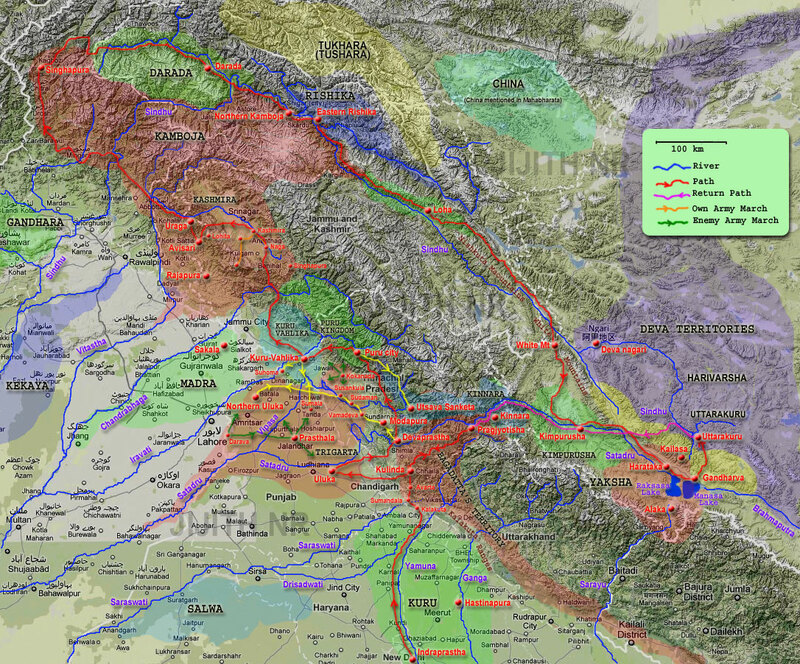 These territories lied along the Satadru (Sutluj) and Sindhu (Indus) river in Tibet. Details of Arjuna's military campaigns in Bhagadatta's territories are moved to the article titled, Arjuna in Pragjyotisha. Details of Arjuna's military campaigns in and around Trigarta territories are moved to the article titled, Arjuna In Trigarta. Details of Arjuna's military campaigns in the regions influenced by the Kambojas are moved to the article titled, Arjuna In Kamboja. Details of Arjuna's military campaigns in the Tibetan territories are moved to the article titled, Arjuna In Tibet. After reaching the Uttarakuru territories in Harivarsha Arjuna returned back to Indraprastha. Mahabharata does not mention how Arjuna returned back to Indraprastha, unharmed with all the wealth he acquired, without being attacked at enemy territories. He probably chose to return along the Satadru (Sutluj) river rather than the risky and lengthy route along the Sindhu (Indus) river. In this journey he would then pass through the countries of Gandharvas, Yakshas and Kimpurushas under the influence of Kuvera and also through the the territories of Kinnaras and Pragjyotisha under the influence of Bhagadatta. Since both Kuvera and Bhagadatta supported Arjuna, he could reach Indraprastha safely with all the collected tribute. From the analysis of Arjuna's campaign to the north we learn that the path traversed spanned north, north-west and north-east direction from the vantage point of Indraprastha, true to the definition of this campaign as a 'northern' military campaign as mentioned in Mahabharata. This analysis rules out the placement of Pragjyotisha in the far-east (Gohati, Assam). From Indraprastha, the Pragjyotisha in Assam would lie in the eastern direction! The direction of east was assigned to Bhima. In Bhima's eastern military campaign there is no mention of Pragjyotisha though he reached as far east as the banks of Lohity (Brahmaputra) river. Pragjyotisha in Assam could be the result of later eastern migrations from the Pragjyotisha of Himachal Pradesh. Or else it could be a fringe-territory that lied under Pragjyotisha's ruler Bhagadatta. Similarly the placement of Vahlika in the far-west in Balkh (north western Afganistan) seems to be a later migration from the Kuru-Vahlika in the northern Punjab. Arjuna was not successful in conquering and getting tribute from all the territories in the north. Arjuna tried to bring the Trigartas with their capital Prasthala (Jalandhar) under his sway but failed. First he tried to attack the Trigarta city from the Uluka territories in the south. Next he tried it from the Uluka territories in the north. He might have also tried an attack from the Vahlika territory in the north. Arjuna could not however overcome the Trigarta forces. The Daravas and Kokanadas too joined with the Trigartas in resisting Arjuna. They, it seems not only defended their territory but also worked together to sabotage Arjuna's military campaign, preventing him from going any further north beyond territories under Trigarta influence. Similarly, Arjuna could not defeat the Kambojas at their stronghold viz. their main city Rajapura (Rajouri). However he managed to defeat and extract tribute from the cities and territories controlled by the Kambojas. (The cities thus conquered included Avisari and Simhapura; the territories included Kashmira, Uraga and the territories of allied tribes like Darada, Rishika and Loha). Not only did Arjuna fail to extract tribute from the Trigartas at Prasthala and the Kambojas at Rajapura, they both turned bitter enemies of Arjuna due to his notorious military campaigns in their territories. Both of these groups vehemently fought against Arjuna in the Kurukshetra War. Arjuna did not go to Madra, Kekaya or Gandhara territories though they lied adjacent to Trigarta and Kamboja territories. Probably these territories were supposed to be visited by Nakula as part of his western-military campaign for Rajasuya. These territories lied to the north-west of Indraprastha. I have formerly written about these ethnic groups in Wikipedia:- Exotic_tribes_of_ancient_India in March-April 2006. This article now contains view-points of other contributers too. I am not maintaining it now. The result of my research on this topic after 2006 till date will be published in this web-site. There is now more geographical accuracy in locating these tribes. The positioning of the territories of the tribes like Rakshasa (Manali, Himachal-Pradesh) Kinnara (Kinnaur, Himachal Pradesh), Kumpurusha (Zanda, Tibet), Yaksha (Burang, Tibet), Gandharva (Ger, Tibet) and Deva (Ger, Rutog and Gegyai: Tibet) as a continuous region in Himachal-Prasesh of India and Ngari_Prefecture of Tibet (China), explains the reason why Mahabharata considers these tribes as inter-related. These tribes formed a distinct ethnic group during the time of Mahabharata, sharing among them a common geographical region. Due to their placement in these geographies, not easily accessible to the people in the Indo-Gangatic plains (who authored Mahabharata) they were mystified. Myths were spun around them. Their culture was not less than that of the people of Indo-Gangatic plain. They had wealth of diverse kinds. Their cities were often an inspiration for building similar cities in Indo-Gangatic plain. Indraprastha the Pandava city is often compared with cities like Alaka of Yaksha king Kuvera and the cities of the Devas like the Amaravati and Devanagari of Indra and Bhogavati of the Nagas. The Uttarakurus in the Deva territory were an inspiration for the Kurus in the Indo-Gangatic plain. Mahabharata also mentions about the Asura kingdoms in this region in another context (Kingdom of Asura-Vrishaparva, in Tibet to the north of Uttarakhand). Nagas were also mentioned as having territories in the adjacent regions (Nagarzê, Nang, Nagchu). Thus some of the Deva-Asura and Naga-Garuda battles could have taken place in this region. More about this will be discussed in another article. Arjuna obtained as tribute good quality horses belonging to the Kambojas, Daradas and Rishikas. These horses were known for their speed. He also got horses (belonging to Tittiri, Kalmasha, Manduka breed) from the Gandharva tribe in Tibet. From Uttarakuru he got many cloths and ornaments of celestial make, silks of celestial texture and skins of celestial origin. Here the word 'celestial' is to be understood as good-quality or of exotic type. From Kulinda region he might have got many agricultural products grown on the mountains. From Singhapura he might have got numerous valuable trade goods originating in far-away lands. Bhagadatta of Pragjyotishia and the kings of Kimpurusha and Guhyaka territories might have given him plenty of wealth as these regions ware then known for their wealth. The Yaksha king Kuvera ruling in these regions was well known as the lord of treasures. Details of the tributes obtained for Rajasuya from various kingdoms will be discussed in another article. As part of his northern military campaign, Arjuna collected the largest amount of wealth as tribute for the Rajasuya sacrifice among all the four brothers of king Yudhisthira, the other brothers being Bhima who went to the east, Nakula who went to the west and Sahadeva who went to the south. Thus Arjuna earned the title Dhanan-jaya (Dhana = wealth; jaya = victory), the winner of much wealth.